This article is about the Space Shuttle flight. For Synchronous Transport Signal (level)-1 in the SONET hierarchy, see Synchronous optical networking. For the gene, see STS-1 (gene). Both Young and Crippen were selected as the STS-1 crew in March 1978. Young was the most experienced astronaut in NASA at the time and was also the only member of his astronaut class in service. He flew twice on Gemini and twice on Apollo, walked on the Moon in 1972 as the Commander of Apollo 16, and became Chief of the Astronaut Office in 1974. Crippen, who had joined NASA in 1969 after the cancellation of the Manned Orbiting Laboratory, was a rookie and would become the first of his astronaut group to fly in space. Prior to his selection on STS-1, Crippen participated in the Skylab Medical Experiment Altitude Test and also served as a capsule communicator for all three Skylab missions and the Apollo-Soyuz Test Project. Columbia was manifested with EMUs for both Young and Crippen in the event of an emergency spacewalk. If such an event occurred, Crippen would go outside the orbiter, with Young standing by in case Crippen required assistance. This crew flew on STS-2. During the original planning stages for the early Space Shuttle missions, NASA management felt a need to undertake initial tests of the system prior to the first orbital flight. To that end, they suggested that STS-1, instead of being an orbital flight, be used to test the Return To Launch Site (RTLS) abort scenario. This involved an abort being called in the first few moments after launch, and using its main engines, once the SRBs had been jettisoned, to power it back to the launch site. This scenario, while potentially necessary in the event of an early abort being called, was seen as being extremely dangerous and, as a consequence, John Young overruled the proposal, and STS-1 went ahead as the first orbital mission. The NASA managers were swayed by Young questioning the need for the test, and the weight of his opinion was strong especially as someone who not only had been to the moon twice, but had walked on it. He would fly the Shuttle again on the STS-9 mission, a ten-day flight in 1983. Let's not practice Russian roulette, because you may have a loaded gun there. 1 10 Apr 1981, 7:00:00 am Scrubbed — Technical (T-18) Timing problem in one of Columbia's general-purpose computers. A software patch was installed to correct. John, we can't do more from the launch team than say, we wish you an awful lot of luck. We are with you one thousand percent and we are awful proud to have been a part of it. Good luck gentlemen. Ignition of the three Space Shuttle Main Engines (SSMEs) was sensed as a sharp increase in noise. The stack rocked "downwards" (towards the crew's feet), then back up to the vertical, at which point both Solid Rocket Boosters (SRBs) ignited. Crippen likened lift-off to a "steam catapult shot" (such as when an aircraft is launched from an aircraft carrier). The stack's combined northwards translation and climb above the launch tower's lightning rod were readily apparent to Young. After clearing the tower the stack began a right roll (until the +Z axis or vertical fin pointed) to a launch azimuth of 067° True (in order to achieve an orbital inclination of 40.3°), and pitched to a "heads down" attitude (to reduce loading on the wings). Simultaneously control was passed from the launch team in Florida to Flight Director Neil Hutchinson's Silver team in Flight Control Room 1 (FCR 1) in Texas with astronaut Dan Brandenstein as their CAPCOM. 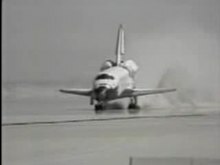 Columbia's SSMEs were throttled down to 65% thrust to transit the region of Max q, the point during ascent when the shuttle undergoes maximum aerodynamic stress. This occurred 56 seconds into the flight at Mach 1.06. The wind corrected value was 606 pounds per square foot (predicted 580psf, limit 620psf). The two SRBs performed better than expected causing a lofted trajectory, and were jettisoned after burnout at 2 minutes and 12 seconds (at 174,000 feet altitude, 9,200 feet higher than planned). After 8 minutes and 34 seconds Mission Elapsed Time (MET) the SSMEs were shut down (MECO, at altitude 388,000 feet) and the external tank (ET) was jettisoned 18 seconds later to eventually break up and impact in the Indian Ocean. Two twin-engined Orbital Manoeuvring System (OMS) engine burns of 86 seconds duration initiated at 10 minutes and 34 seconds MET and 75 seconds duration at 44 minutes 2 seconds MET inserted Columbia into a 132.7 x 133.7 nautical mile orbit. This subtle deviation from the original plan of 130 nm circular went largely unnoticed. In fact it adjusted the spacecraft's orbital period to take account of the April 10th scrub, so that attempts could still be made to use KH-11 reconnaissance satellites to image Columbia on orbit. Overall Young commented that there was a lot less vibration and noise during launch than they had expected. However, the sensations accompanying the first firing of the large Reaction Control System (RCS) jets surprised the crew. Crippen commented "it's like a big cannon just fired . . . you don't like them the first time you hear them". Young reported that "the entire cabin vibrates . . . it felt like the nose was being bent". The majority of the crew's approximately 53 hours in low Earth orbit was spent conducting systems tests. Despite the scheduling impact of efforts to image Columbia's TPS by utilising external assets, these were all accomplished. They included: Crew Optical Alignment Sight (COAS) calibration, star tracker performance, Inertial Measurement Unit performance, manual and automatic RCS testing, radiation measurement, propellant crossfeeding, hydraulics functioning, fuel cell purging and photography. The OMS-3 and OMS-4 burns at 006:20:46 and 007:05:32 MET respectively raised this orbit to 147.9 x 148 nm (compared to a planned 150 nm circular). These two firings were single engined utilising the crossfeed system. The crew reported a cold first night on board despite acceptable temperature indications. They found the second night comfortable after settings were adjusted. During the second day of the mission, the astronauts received a phone call from Vice President George H. W. Bush. President Ronald Reagan had originally intended to visit the Mission Control Center during the mission, but at the time was still recovering from an assassination attempt which had taken place two weeks before the launch (in fact Reagan had only returned home to the White House the day prior to the launch). The crew awoke from their second sleep period, earlier than planned. Preparations for return to Earth began with breakfast. Stowing of cabin items, flight control system checkout, data processing system reconfigurations, and then ejection suit donning followed. In Houston the Crimson team headed by their Flight Director Don Puddy came on duty in FCR 1 for the mission's final shift. His CAPCOM was astronaut Joe Allen with Rick Hauck assisting. Payload bay door closing was a critical milestone to ensure vehicle structural and thermal integrity for re-entry. If power closing had failed, Crippen was trained to conduct a one-man extravehicular activity (EVA) to manually winch them closed. With cabin switch positions verified, the crew strapped into their ejection seats. Meanwhile, JSC pilots Charlie Hayes and Ted Mendenhall were airborne over California's Edwards Air Force Base area in a Shuttle Training Aircraft (STA) performing a final check of landing weather conditions. Auxiliary Power Units (APUs) 2 and 3 were started (to provide flight control hydraulic pressure). The 160 second twin-engine OMS de-orbit burn took place during the 36th orbit over the southern Indian Ocean and changed the orbital parameters from 146 x 148 nm to 146 x 0 nm. This ensured atmospheric capture of the spacecraft close enough to the planned landing site to have sufficient energy for a controlled glide landing, but not so close that energy would have to be dissipated at a rate exceeding its structural capability. Young then slowly pitched Columbia up to the wings level nose high entry attitude. Both crew members armed their ejection seats during this pitch around. Nearly half an hour later APU 1 was started as planned. Shortly afterwards Columbia entered an approximately 21 minute long communications blackout. This was due to a combination of ionisation (16 minutes) and lack of ground station coverage between Guam and Buckhorn. Entry Interface (EI) was reached over the eastern Pacific Ocean 4,380 nm from the landing site at a speed of around 15,250 knots (28,230 km/h). EI is merely an arbitrarily defined geodetic altitude of 400,000 feet (121.9 km) employed by NASA for the purposes of trajectory computations and mission planning. Above this altitude, the spacecraft is considered to be outside the "sensable atmosphere". Most of this first Orbiter entry was flown automatically. An initial angle of attack of 40° had to be maintained until through the most severe aerodynamic heating after which it was gradually reduced. At about 330,000 feet altitude a light pink air glow caused by entry heating became visible, and both crew members lowered their visors. Columbia had to manoeuvre 315 nm "cross range" of its orbital ground track to reach the planned landing site during the entry. Consequently, a roll into a right bank was flown when the air density had increased sufficiently to raise dynamic pressure to 12 psf (with speed still in excess of Mach 24 and approximately 255,000 feet altitude). Automatic roll reversals to control energy dissipation rate and cross range steering were performed at around Mach 18.5 and Mach 9.8. The crew clearly observed the coast of California as Columbia crossed it near Big Sur at Mach 7 and 135,000 feet. Both the Mach 4.8 and Mach 2.8 roll reversals were automatically initiated and manually completed by Young. The last RCS jet firing took place at an altitude of 56,000 feet - 14,000 feet lower than desired (due to a predicted risk of combustion chamber explosion). STS-1 crew in Space Shuttle Columbia's cabin. This is a view of training in 1980 in the Orbiter Processing Facility. Similar to the first Saturn V launch in 1967, NASA underestimated the amount of noise and vibration produced by the Shuttle. Shock waves from the SRB thrust were deflected up into the orbiter's tail section, which could have caused structural or other damage. An improved water suppressant system was later installed in LC 39A to dampen vibrations. Pilot Crippen reported that, throughout the first stage of the launch up to SRB separation, he saw "white stuff" coming off the External Tank and splattering the windows, which was probably the white paint covering the ET's thermal foam. The astronauts' on-orbit visual inspection showed significant damage to the thermal protection tiles on the OMS/RCS pods at the orbiter's aft end, and John Young reported that two tiles on the nose looked like someone had taken "big bites out of them." The Air Force also photographed the orbiter using a KH-11 KENNEN reconnaissance satellite. Due to the top secret nature of the satellite, only a small number of NASA personnel were aware of this, and they had arranged for the photography prior to the launch as a precaution to make sure no damage had been done to the thermal tiles on the underside of the orbiter, as there had never been a flight of a manned spacecraft before where the heat shield was exposed to the vacuum of space for the entire duration of the mission. Young and Crippen were instructed to perform maneuvers with the RCS thrusters to align Columbia so that the KH-11 could photograph it, but were not informed of the reason for them. Aligning the shuttle's low Earth orbit with the KH-11's polar orbit was a somewhat tricky move, and launch on April 12 was scheduled for a few minutes after the launch window opened, due to the need to get the KH-11 into correct orientation for imaging the shuttle. Images obtained confirmed that damage to Columbia was not serious. Post-flight inspection of Columbia confirmed that approximately 16 undensified tiles near the OMS pod had been lost during ascent. Columbia's aerodynamics at high Mach numbers during reentry were found to differ significantly in some respects from those estimated in pre-flight testing. A misprediction of the location of the center of pressure (due to using an ideal gas model instead of a real gas model) caused the computer to have to extend the body flap by sixteen degrees rather than the expected eight or nine. Also, the first roll manoeuvre resulted in lateral and directional oscillations during which side slip angles of up to 4° were reached. This was twice as high as predicted. Analysis attributed the cause to unexpectedly large rolling moments due yaw RCS jet firings. It should be noted that during the early stages of entry, orbiter roll control is achieved as a result of sideslip modulation. The orbiter's heat shield was damaged when an overpressure wave from the solid rocket booster caused a forward RCS oxidizer strut to fail. The same overpressure wave also forced the shuttle's "body flap"–an extension on the orbiter's underbelly that helps to control pitch during reentry–into an angle well beyond the point where cracking or rupture of its hydraulic system would have been expected. Such damage would have made a controlled descent impossible, with John Young later admitting that had the crew known about this, they would have flown the shuttle up to a safe altitude and ejected, causing Columbia to be lost on the first flight. This appears to contradict remarks Young has made several times stating how skeptical he was of the prospects of successful ejection whilst the SRBs were still attached and burning (e.g. in a 2006 interview: "if you had to use ejection seats to jump out while the solid rocket motors were still burning, you probably would have ignited yourself . . ."). The SRBs were not jettisoned until Columbia was well above the ejection seat envelope. The strike plate next to the forward latch of Columbia's external tank door was melted and distorted due to excess heat exposure during reentry. This heat was attributed to an improperly installed tile adjacent to the plate. Despite these problems, the STS-1 mission was completed successfully, and in most respects Columbia performed optimally. After some modifications to the Shuttle and to the launch and reentry procedures,Columbia flew the next four Shuttle missions. The ultimate launch date of STS-1 fell on the 20th anniversary of Yuri Gagarin's Vostok 1, the first spaceflight to carry a human crew. In 2001, Yuri's Night was established to celebrate both events. In a tribute to the 25th anniversary of the first flight of Space Shuttle, Firing Room 1 in the Launch Control Center at Kennedy Space Center – which launched STS-1 – was renamed the Young-Crippen Firing Room. NASA described the mission as "the boldest test flight in history". STS-1 and STS-2 were the only two shuttle flights to have the ET painted white. To reduce the Shuttle's overall weight, all flights from STS-3 onward used an unpainted tank. The use of an unpainted tank provided a weight saving of approximately 272 kilograms (600 lb), and gave the ET the distinctive orange color which later became associated with the Space Shuttle. The song "Countdown", by Rush, from the 1982 album Signals, was written about STS-1 and the inaugural flight of Columbia. The song was "dedicated with thanks to astronauts Young and Crippen and all the people of NASA for their inspiration and cooperation". The footage of the launch was commonly played on MTV throughout the 1980s and 1990s, and was, in fact, the very first thing shown on the channel, along with footage of Neil Armstrong on the Moon, and the launch of Apollo 11. IMAX cameras filmed the launch, landing, and mission control during the flight, for a film entitled Hail Columbia!, which debuted in 1982 and later became available on DVD. The title of the film comes from the pre-1930s unofficial American national anthem, Hail, Columbia. The beginning of the song "Hello Earth", on Kate Bush's 1985 Hounds Of Love album, contains a short clip of dialogue between Columbia and Mission Control, during the last few minutes of its descent, beginning with "Columbia now at nine times the speed of sound…"
NASA began a tradition of playing music to astronauts during the Gemini program, and first used music to wake up a flight crew during Apollo 15. A special musical track is chosen for each day in space, often by the astronauts' families, to have a special meaning to an individual member of the crew, or in reference to the day's planned activities. I think it is only right that we mention a couple of guys that gave their lives a few weeks ago in our countdown demonstration test: John Bjornstad and Forrest Cole. They believed in the space program, and it meant a lot to them. I am sure they would be thrilled to see where we have the vehicle now. STS-1 Pilot Robert Crippen, tribute given on-orbit to the victims of the accident. An accident occurred on March 19, 1981 that led to the deaths of three people. During a countdown test for STS-1, a pure nitrogen atmosphere was introduced in the aft engine compartment of Columbia to reduce the danger of an explosion from the many other potentially dangerous gases on board the orbiter. At the conclusion of the test, pad workers were given clearance to return to work on the orbiter, even though the nitrogen had not yet been purged due to a recent procedural change. Three technicians, John Bjornstad, Forrest Cole, and Nick Mullon, entered the compartment without air packs, unaware of the danger since nitrogen gas is odorless and colorless, and lost consciousnesses due to lack of oxygen. Several minutes later, another worker saw them and tried to help, but passed out himself. The fourth did not alert anyone, but was himself seen by two other people. Of those two, one alerted a security guard and another went to help the unconscious group. The security guard entered the compartment with an air pack and removed the five men from the compartment. Security procedures delayed ambulances from arriving on the scene by several minutes. Bjornstad died at the scene; Cole died on April 1 without ever regaining consciousness, and Mullon suffered permanent brain damage and died on April 11, 1995 from complications of his injuries. These were the first launchpad deaths at Canaveral since the Apollo 1 fire, which claimed the lives of three astronauts during preparations for the manned moon landing missions. The incident did not delay the launch of STS-1 less than a month later, but pilot Robert Crippen gave an on-orbit tribute to Bjornstad and Cole. A three-month inquiry determined a combination of a recent change in safety procedures and a miscommunication during the operations were the cause of the accident. A report called LC-39A Mishap Investigation Board Final Report was released with the findings. The names of John Bjornstad, Forrest Cole and Nicholas Mullon are engraved on a monument at the US Space Walk of Fame in Florida. Columbia's arrival at Complex 39A, December 29, 1980. Columbia at Launch Pad A, Complex 39, April 12, 1981. Commander John Young (right) and Pilot Robert Crippen (left) suit up for launch, April 12, 1981. Columbia lifts off at the beginning of STS-1. Columbia's cargo bay and aft section, April 12, 1981. Columbia landing on Rogers dry lake bed at Edwards Air Force Base, April 14, 1981. Columbia after its successful landing. An overall view of the Mission Operations Control Room in Houston during Columbia's landing phase. Columbia, mated to the Shuttle Carrier Aircraft, arrives at Kennedy Space Center after STS-1 to be prepared for its next mission. ^ "STS-1 Press Kit" (PDF). NASA. 1981. p. 36. Retrieved 28 November 2012. ^ a b c STS-1 Transcript. Internet Archive. Retrieved 19 October 2012. ^ a b c Dunn, Terry (26 February 2014). "The Space Shuttle's Controversial Launch Abort Plan". Tested. Retrieved 31 March 2015. ^ "Space Shuttle Mission Summary" (PDF). NASA Johnson Space Center. Archived from the original (PDF) on 22 December 2016. Retrieved 4 February 2017. ^ Mission Operation Report Space Shuttle Program STS-1 Postflight Report (Report). NASA. 1981. ^ C.F. Ehrlich Jr. "Why The Wings Stay On The Space Shuttle Orbiter During First Stage Ascent" (Report). AIAA. ^ Legler R. D. and Bennett F. V. (2011). "Space Shuttle Missions Summary, NASA TM-2011-216142" (PDF). NASA. ^ Mission Operation Report Space Shuttle Program STS-1 Launch (Report). NASA. 1981. ^ a b c d e White, Rowland; Truly, Richard (2017). Into the Black: The Extraordinary Untold Story of the First Flight of the Space Shuttle Columbia and the Astronauts Who Flew Her (revised). Touchstone. p. 243. ISBN 9781501123634. ^ Cohen A. (1981). STS-1 Orbiter Final Mission Report. NASA JSC Mission Evaluation Team. p. 7 to 10. ^ Woods W.D. (2011). How Apollo Flew To The Moon. Springer-Praxis. p. 469. ISBN 978-1-4419-7178-4. ^ James J. (1988). Entry Guidance Training Manual. NASA JSC Mission Operation Directorate. ^ a b "STS-1 Overview". NASA. Retrieved 22 August 2010. ^ "FAQ: Why do you drop water under the shuttle as the engines start?". NASA. 5 January 1999. Archived from the original on 15 May 2013. ^ "The Space Review: Passing in silence, passing in shadows". www.thespacereview.com. ^ King, James R. (13 April 1981). "NASA says missing tiles no threat to shuttle". The Madison Courier. Associated Press. Retrieved 22 January 2013. ^ a b c d e "STS-1 Anomaly Report" (PDF). NASA. 27 February 2003. Archived from the original (PDF) on 7 October 2006. Retrieved 14 July 2006. ^ Iliff, Kenneth; Shafer, Mary (June 1993). "Space Shuttle Hypersonic Aerodynamic and Aerothermodynamic Flight Research and the Comparison to Ground Test Results". Google Docs. pp. 5–6. Retrieved 16 February 2013. ^ "L+25 Years: STS-1's Young and Crippen". collectSPACE. ^ Jeff Foust (14 April 2003). "John Young's shuttle secret". Space Review. Retrieved 22 August 2010. ^ Cohen A. (1981). STS-1 Orbiter Final Mission Report. NASA JSC Mission Evaluation Team. p. 152 to 237. ^ "STS-1 Press Kit" (PDF). NASA. 1981. p. 3. Retrieved 30 July 2016. ^ "NASA – STS-1". Nasa.gov. Retrieved 12 August 2010. ^ NASA. "NASA Takes Delivery of 100th Space Shuttle External Tank." Press release. p. 99–193. 16 August 1999. Retrieved 17 July 2013. ^ "25 years later, JSC remembers shuttle's first flight". JSC Features. Johnson Spaceflight Center. 2006. Retrieved 3 March 2010. ^ "Chronology of Wakeup Calls" (PDF). NASA. 13 May 2015. Retrieved 29 June 2016. ^ "The Greatest Test Flight STS-1 (Full Mission 06, 37 minutes+)". youtube "lunarmodule5". Retrieved 28 February 2018. ^ a b c d e Burlison, Terry. "Columbia's First Victims". www.baen.com. Baen Books. Retrieved 27 January 2017. ^ a b Wilford, John Noble (20 March 1981). "SHUTTLE PASSES TEST; A WORKER IS KILLED". The New York Times. ISSN 0362-4331. Retrieved 10 January 2017. ^ a b c d Long, Tony (19 March 2009). "March 19, 1981: Shuttle Columbia's First Fatalities". WIRED. Retrieved 27 January 2017. ^ "The Orlando Sentinel from Orlando, Florida on April 13, 1995 · Page 192". Young, John W.; Crippen, Robert L. (October 1981). "Columbia's Astronauts' Own Story: Our Phenomenal First Flight". National Geographic. Vol. 160 no. 4. pp. 478–503. ISSN 0027-9358. OCLC 643483454. Wikimedia Commons has media related to STS-1. NBC News coverage of launch of STS-1. Hail Columbia! on IMDb .